When a woman named Rachel Howatt realized her sweet dog was loose, she was worried. It was December and her husky, named Koda, was nowhere to be found. Rachel searched all around the woods near her home but unfortunately did not see her dog Koda anywhere. But thankfully a few days later Koda returned on her own back home in Manitoba, Ontario. When she arrived, Koda acted like nothing had happened. Rachel says she searched all around the area near her home and she was nowhere to be found—but she knew that Koda was a very smart dog. Rachel knew Koda could find her way back home, and that’s just what the husky did. But Rachel was curious: where did Koda go for those two days she was gone? 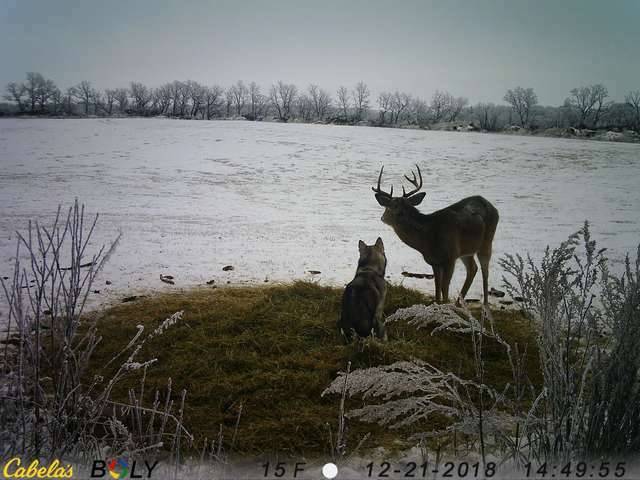 So, Rachel contacted a neighbor who she knew had a trail camera set up in the area. Rachel was hoping that the camera had spotted Koda and the neighbor checked and she was right: Koda was on camera and she was not alone in her adventures. 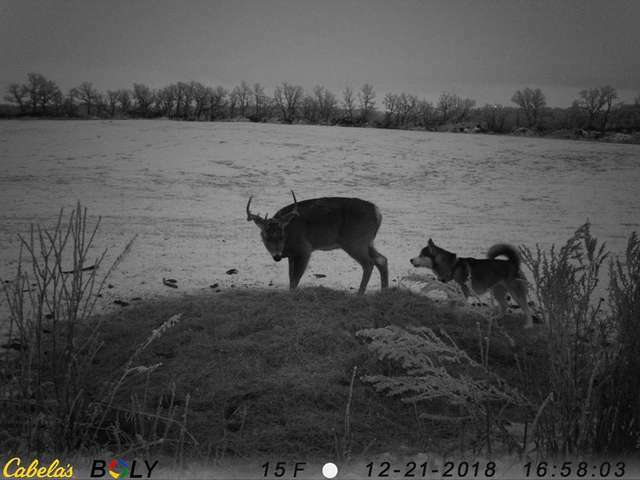 It seems that Koda the dog had befriended a male deer. 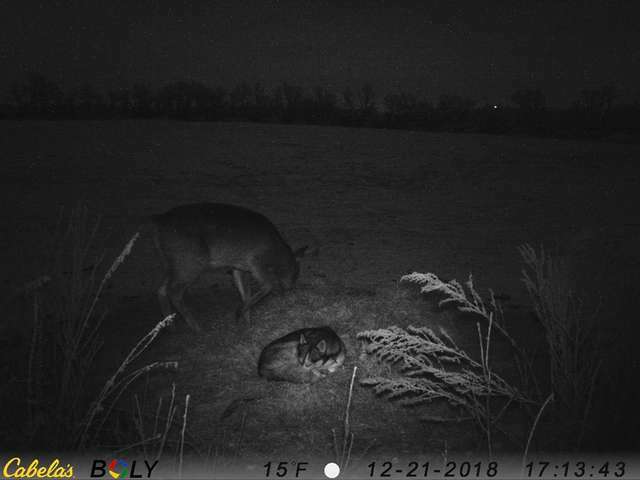 The pair were spotted on camera taking naps and eating together. Koda and the deer even played together and the large buck seemed to enjoy the company of the dog. Rachel couldn’t believe her eyes when she viewed the video. 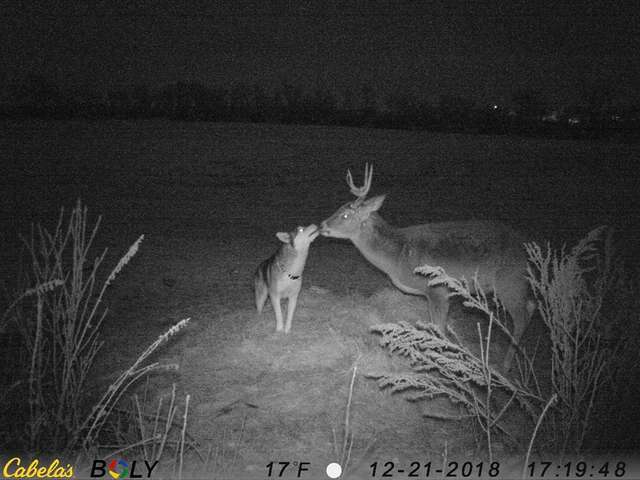 Rachel thinks the deer and Koda spent about 12 hours together and were even joined by another buck at one point. There are plenty of other stories of deer befriending animals that have lost their way, like cows that have run away or even cats they encounter out in the wilderness. Rachel certainly does not want Koda to run off again, but she has a suspicion that her adventure loving husky may try to reunite with her new wild deer friend in the future.